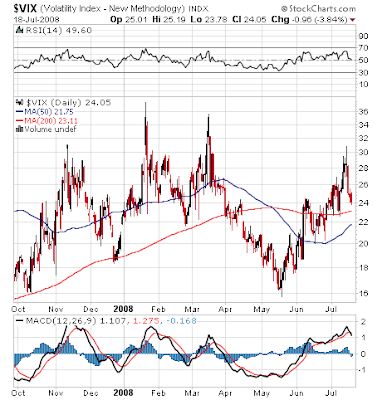 Bull Bear Trader: VIX Confirmation, Or Is It All About Oil? VIX Confirmation, Or Is It All About Oil? There has been a lot of anticipation recently as to when the VIX would finally spike back into the 30's. Recent moves above 30 in November, January, and March have produced temporary bottoms, although the November and January relief rallies were short lived, and the March rally rolled over 2 months later. The VIX briefly touched into the 30's last week, but quickly corrected back into the mid-20's. Some are arguing that not only was the recent move into the 30's too short, but a confirmation spike probably needs to now be in the mid-30's (if the old rules-of-thumb don't work, try another). Given the recent market action, it appears that more than changes in market sentiment are necessary to reverse the current bear market. Others have recently mentioned that even with the bullish market sentiment indicators, the cycle of news flow probably needs to change before we see a strong, longer-term rally. The recent pullback in the VIX, after briefly touching above 30, also has some wondering if fear has been vanquished from the markets. As mentioned before, I believe that the recent SEC actions explain some of the current moves, and that crude oil is still the main story and will continue to determined whether the market will hold any rally or reverse. The market is still at such a tenuous position that reports of continued breakdowns in diplomatic discussion or slight disruptions in the supply/demand balance will be enough to spike crude prices and send the market to new short-term highs and lows. Given the upcoming weekly economic data on crude oil inventory levels, the leading indicators number, existing and new home sales, durable goods orders, and revisions on consumer sentiment, it should once again be an interesting week. Regarding the news flow cycle, I think WFC, JPM and C may have stemmed the negative tide -- with support from the new "pre-borrow" short sale mandate. Obviously falling oil prices aren't hurting any. Nice work on the blog. I look forward to reading more. Thanks Bill. As always, I continue to read the VIX And More blog, and encourage others to do the same. You may be right on Wells Fargo, JP Morgan, and Citi. The other financials may also follow suit. I just want some confirmation that it is more than an "SEC induced" or "oil sell off" based short-term rally. Good housing data would probably do the trick.